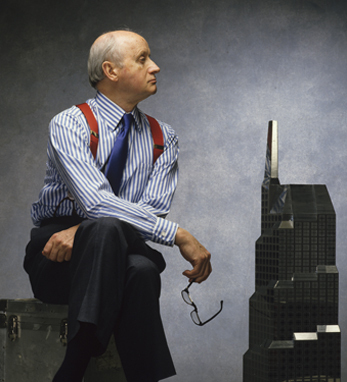 Kevin Roche has established himself as one of the finest modern architects of his generation. He has shaped the American landscape with his stunningly innovative buildings – corporate, educational and residential – in areas both urban and suburban. The visionary behind projects including the Ford Foundation building in New York, the skyscrapers of the U.N. Plaza, California’s Oakland Museum and the geometric Union Carbide Corporation headquarters in Danbury, CT, Roche was awarded the Pritzker Prize, the highest honor in his field, in 1982. He has also completed impressive original projects such as the Conference Center on the banks of Dublin’s Liffey, the massive Santander Headquarters in Spain and the soaring glass Shiodome in Tokyo’s city center. And has worked on important renovations, most notably his ongoing work with the Metropolitan Museum of Art in New York. Roche was born in Dublin on June 22, 1922 – he attended Rockwell College in Co. Tipperary. He went to study what was then the small architecture department at University College Dublin, after which he apprenticed with Michael Scott, who was then Ireland’s leading architect. In 1941, he received his first solo commission from his father – a piggery to house 5,000 hogs. In 1948 he decided to pursue a post-graduate degree at the Illinois Institute of Technology. Harvard and Yale also accepted him. His studies at the IIT were cut short when his funds ran dry. He wound up in New York, where he sought work at the massive United Nations building site. They didn’t have any openings for architects, so he worked as an office boy. Roche hadn’t planned on staying in America long-term, but an opportunity presented itself. He heard that the famous Eero Saarinen was looking for apprentices. His work with Saarinen would be pivotal to the course of his career and to his own architectural philosophy. After becoming the firm’s senior design associate in 1954, he worked closely with Saarinen on such projects as the St. Louis Arch, Washington, D.C.’s Dulles International Airport and the CBS headquarters in New York. Many of those projects were still under way in 1961 when Saarinen died suddenly, and Roche and John Dinkeloo, the head of production, were named the new partners of the firm, which was in the process of relocating to the East Coast at the time. They carried on, finishing Saarinen’s remaining projects before landing their first major commission as a team, the Oakland Museum in California. They started their own firm, Kevin Roche, John Dinkeloo and Associates in 1966. They worked fruitfully together on many prominent commissions until Dinkeloo’s death in 1981. Since then, Roche has designed such buildings as the Nations Bank Plaza – the tallest building in Atlanta – the Museum of Jewish Heritage in downtown Manhattan and its moving Holocaust Memorial, and New York University’s Kimmel Center for University Life. He has also overseen the intensive renovations of the Metropolitan Museum of Art in New York.